Fruit of the month clubs have been around well before the invention of the internet. They’ve been a staple gift basket for co-workers, friends, and family. However, monthly fruit baskets aren’t just a luxurious gift anymore. They’re also a simple way to stock up on delicious, healthy fruits for yourself, your family, or your office. By getting convenient deliveries from a fruit club, it makes eating in-season fruit so much easier. There are tons of options out there, some of which offer organic fruits, some that send exotic favorites, and others that send you all the classics. There’s even one we included below for the cheese lovers that need something savory with their fruits. Do they offer in-season fruit? Do they offer variety of boxes and fruits? If you’re on the hunt for a fruit of the month club that’s going to give you a wide variety of options options, The Fruit Company is one to consider. They have four different “HarvestClub” selections, all of which will ensure you some delicious, fresh fruit each month. Those choices include the Americana, Exotica, Organic, and Medley. With the HarvestClub Americana, you’re getting a selection of traditional fruits. This includes oranges, pears, apples, pineapple, cherries, blueberries, and many others. It’s their most popular selection for a good reason — you can’t go wrong with classic favorites. But if you’re feeling more adventurous, you can sign-up for the Exotica club, which gets you blood oranges, star fruit, champagne mangos, persimmons, pomegranates, and others you’re unlikely to find at your local supermarket. With the Organic option, you’re getting fruits like oranges, apples, pears, peaches, nectarines, and more. Each fruit you receive will be USDA-certified organic. That means you don’t have to worry about pesticides lingering on your fresh fruit. And finally, there’s the Medley club that gets you two fruit pairings each month. You’ll receive boxes such as Navel Oranges and Honeybell Sweets, Sugar Red Grapefruit and Mandarin Oranges, and Hawaiian and Strawberry Papaya. The main benefit of this box is that the fruits are chosen based on how well they compliment eachother. Manhattan Fruitier specializes in sending only fruit that is in season when picked. This ensures you’re much more likely to only get high-quality fruits in your box. This is converse to fruit found at your local grocer, which isn’t always picked when it’s in season. Manhattan Fruitier is a bit different than other traditional fruit of the month clubs. This is due to the fact that you may not always get just fruit in your box. There are some months where you’ll find a guacamole kit, nuts, vegan sweets, or even their caramel apple dipping kit. Why? Because they have to parse out how often they send fruit to make sure that they’re only sending the highest quality (in season) varieties. The best part of their service is you can see what each month has to offer before you commit yourself to any subscription. As far as fruit clubs go, Harry & David’s is one of the oldest and most well known. Similar to The Fruit Company, they actually have a few different options you can choose from when signing up. They offer their Signature Classic Fruit Club, the Signature Light Fruit Club, Presidential Fruit Club, Medley Fruit Club, Organic Fruit Club, and Citrus Fruit Club. With the Signature Classic Fruit Club, you’re going to receive a selection of some of the finest seasonal fruits. It includes cherries, peaches, dark sweet plums, pears, oranges, strawberries, and so many other tasty fruits to enjoy. If you go for the Signature Light Fruit Club, you’ll get the same types of fruits in the Classic version, but just a smaller amount. The Presidential Fruit Club gets you exotic fruits and speciality varieties of your classic favorites. It features Fuyu Persimmons, Lemon Plums, Gold Nugget Nectarines, Cream of the Crop Royal Rivera Pears, and other delectables. But if you want a mix of fruits each month, I recommend going for my personal favorite, the Medley Fruit Club. This club gets you two types of fruit. Like The Fruit Company, Harry & David will send you a mix-and-match box of handpicked fruits that compliment each other. Past boxes included gold kiwis and plums, pomegranates and persimmons, as well as honeybells and grapefruit. If organic is a must, their Organic Fruit Club has you covered. The fruit in this club is grown, harvested, and packed in accordance with the USDA National Organic Program. This program sets high standards for organically grown fruit. Lastly, their Citrus Fruit Club is a must-have for anyone who can’t resist delicious and tangy clementines, tangerines, grapefruit, oranges, and more! Another way to make sure you’re getting your daily dose of fruits, is to join the Pemberton Farms “Four Seasons of Fruit” club. When you sign-up, you’ll be able to choose between a 3-month, 6-month, 9-month, or 12-month membership. And what’s makes this club a winner is that you can see the full yearly lineup, so you’ll always know which fruits your order will contain. Many other fruit of the month clubs keep this a mystery. When you join the fruit of the month club from Amazing Clubs, you’ll receive two selections of premium, seasonal and exotic fruits. Not only that, but their deliveries average about five pounds in weight, which means you’re getting quite a generous helping to enjoy. Amazing Clubs works closely with the growers to ship out fruit on the same day it has been picked. This not only ensures the fruit is at its freshest when it gets to you, it also ensures you always get the best flavor. They have new selections each spring, summer, fall, and winter. This is so they can pick fruits while they’re in season to deliver to you. Past orders have featured Summer White Peaches and Champagne Mangos, Pink Lady Apples and California Sweet Cara Cara Oranges, Sweet White Nectarines and Japanese Black Plums, and Fairchild Tangerines and California Kiwis. It’s a great assortment that you won’t readily find at the store. What makes Amazing Clubs fruit club one of our top favorites is the fact that they go above and beyond when compared to other fruit of the month clubs. Their prices are lower than Harry & David’s for similar subscriptions, yet you receive more fruit in your Amazing Clubs box. If you’re familiar with Shari’s Berries, you probably know them for their extremely popular chocolate-covered strawberries. But did you know you can actually sign-up for monthly deliveries of their chocolatey goodness? It’s true! They offer three-month, six-month, and 12-month deliveries of their popular chocolate-covered strawberries to satisfy any sweet tooth cravings you may have. That’s not all though… They also offer traditional fruit deliveries, like the others on this list, including their Harvest Select Fruit Club, Harvest Deluxe Fruit Club, and Organic Fruit Club. The difference between the Harvest Select and Harvest Deluxe clubs is the amount of fruit you’re getting. And if you want to stick to organic, they have that option too. Like Harry & David, Hale Groves is another very well known fruit club, and for good reason. 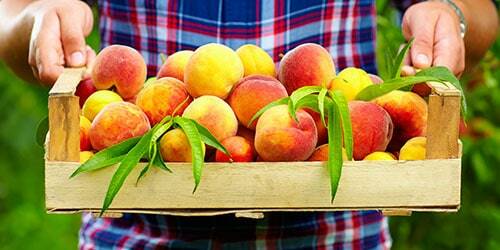 Each month, you’ll receive fresh-picked fruit for you to enjoy and/or share with friends and family. What we love about their service is the massive amount of variety they have on their site. Not only will you find the classic fruit of the month clubs they offer (such as their All Seasons Fruit Club, Never Empty Fruit Bowl Club, and Winter Wonder Club) they also offer single purchases (non-subscriptions). These include fruits for you and fruit baskets/gifts for special occasions. All of your fruity cravings will be satisfied thanks to the fruit of the month club from Pittman Davis. They offer their traditional Harvest-A-Month Club and the Harvest-A-Month Lite Club. The only difference is that the “Lite” option delivers you the same high-quality fruit, but in smaller packages. Which one you go with depends on how much fruit you’d like to receive! There’s a new selection of fruits each month. You’ll find Minneola Tangelos, Cara Cara Oranges, Honey Mandarins, Ruby Red Grapefruit, Ken Mangos, Fuji Apples, and many others. It’s the perfect selection for snacking or even adding to a morning smoothie. The best part is that everything is perfectly ripe and in-season for the best flavor. Upon checking out the offerings from A Gift Inside, you’ll see that they have a few different fruit clubs for you to choose from. There’s the Delite Fruit Club, which allows you to get your choice of two fruit options per month. Or you can go with their Premium Fruit Club that allows you to select three fruit options per month for a little extra variety and more fruits. Of course, if you’re all about the organic produce, the Organic Fruit Club is perfect for you! If you’re someone who needs a little something extra with their fresh fruit, you might want to check out the Light Fruit and Cheese Club or the Premium Fruit and Cheese Club. Both allow you to get a combination of fruit and cheese, which is perfect for snacking. What we love about their service is that they keep things simple and inexpensive. Their DeLite box starts as low as $19.99 per month. For anyone who insists on only eating the freshest, organic produce, Farm Fresh To You has made it easy to get your fix. They have a variety of boxes, so you’re sure to find something that suits your needs. And the best part is, you’ll always get a great selection of ripe, organic produce for you and your family to enjoy. It’s perfect for snacking, baking, or juicing! You can opt for their fruit only box or snag the mixed fruit and veggie option. Either way, you really can’t go wrong. Another great feature of their service is that you can add and remove produce from your delivery and create a “never send” list, making it customizable to your preferences. You can even add artisan farm products like fresh eggs, organic dairy, pickled veggies, honey, and jams to your order. If monthly deliveries aren’t frequent enough for you, simply increase your order to weekly, every other week, or every three weeks. This is a unique addition that almost none of the other clubs offer. The only downside of Farm Fresh to You is that they do not currently deliver to all of the United States. Great Clubs, like Amazing Clubs, is a “general” monthly club service that offers of monthly boxes (e.g. coffee, chocolate, flowers). However, they have a fruit club that is surprisingly on par with many of the “big guys”. You can expect to receive tasty fruits like Comic Pears, Honey Tangerines, Bing Cherries, Taylor’s Gold Pears, Royal Pineapple, and Tropical Kiwi. Each month, they always feature fresh fruits from orchards and fields that are focused on growing quality produce. Why we added them to this list of our favorites is simple. In addition to sending quality fruit, they also have a “Happiness Guarantee”. That means if you’re not happy, let them know and they’ll make it right. They also offer 100% free shipping, a huge plus. When you join FruitShare’s Farm Fresh Fruit Club, you can guarantee you’re going to get flavorful fruits that are packed with nutrients. With each order, you’ll receive a box of in-season, organic fruits to enjoy and share. You’ll find blueberries, cherries, apples, pears, citrus, and so much more. Everything you could ever crave in fruits is right here in your monthly box. For the most value, check out their Farm Fresh Fruit Club Full Share. It features hand-packaged in-season, organic fruit from small farms that use sustainable growing practices. There will be four to six varieties of fruit, meaning you’ll have plenty of options to snack on. Plus, this box weighs approximately 10-14 lbs. and will contain 24-30 pieces of fruit. That’s pretty impressive, compared to the others on this list! But don’t worry, if you’re looking for something smaller they also have Half Share and Simple 6 options for those who don’t want quite as much fruit. Either way, you’re still getting plenty of deliciousness in one box and it’s still incredibly convenient. The second Monday of every month can be a little bit brighter and healthier thanks to California Fruit Gifts and their fruit of the month club. Each box is packaged by hand on the day of your shipment, which guarantees you receive only the highest-quality hand-picked fruit in every box. They offer both organic and non-organic options, depending on what you’re looking for. You can also choose between their Delicious Fruit subscription or Mixed Fruit, and Fruit and Treats. As you might imagine, their Fruit and Treats box comes with more than just fruits. Past boxes has included Organic Navel Oranges with Organic Dark Chocolate-Covered Almonds, Organic Mango with Organic Mixed Nuts, and even Organic Fuji Apples with Organic Roasted Salted Cashews. The key is that they try to pair the fruit with a yummy snack that will compliment it so you can eat both together! Last on our list (but certainly not least) is Naked Fruit Company’s fruit of the month club. They offer three different options, which include their Petite Apple Medley Lovers Club, the Petite Feature Fruit Club, and the Petite Sampler Club. The Petite Apple Medley Lovers Club is great for any apple fan. You’re going to be delivered apples that are hard to come by in traditional grocery stores. These include: Jon Gold Apples, Fuji Apples, Pink Lady Apples, Cameo Apples, Honey Crisp Apples, Rome Apples, and Jazz Apples. Of course, you’ll also receive traditional apple varieties such as Red Delicious and Granny Apples. If you want a little more variety, go for the Petite Feature Fruit Club. It gets you a new fruit each month, which includes things like red pears, clementines, navel oranges, strawberries, pineapple, holiday seedless grapes, and red delicious apples. Every fruit they send is in-season, which gives it the fullest flavor possible. What’s great about the Petite Sampler Club is that it allows you to test out their fruits before committing to a larger subscription. While technically a “fruit box”, Rotten Fruit Box is a bit different than the others on this list. That’s because they only send natural freeze-dried fruits. The story behind this business is one of the main reasons we decided to include them in our list. Upon visiting small local farmers in Portugal and Spain, the owner of Rotten Fruit Box saw an exorbitant amount of fruit left to rot on the ground. This wasn’t because it didn’t taste good (it did) but rather it didn’t “look” good. That’s when the company was born. They offer a multitude of 100% organic freeze-dried fruits such as strawberries, blueberries, blackberries, kiwis, and even figs. So you’ve read through our list of the top fruit of the month clubs but you’re not 100% sure if it’s right for you? That’s okay… A fruit club might not be right for everyone. Now let’s discuss some of the benefits of joining to see if it makes sense for you. Do you ever forget to stock up on fruits at the grocery store? Maybe you don’t want the hassle of picking out the perfect selection of fruit or you simply don’t know what to buy? Well, when you have regular deliveries of fruit coming straight to your door, it’s sure to help you get in your daily dose of vitamins. There won’t be any more excuses of “I have to go to the grocery store” or “this fruit isn’t ripe enough” because the hard work of picking out prime ripe fruits has already been done for you. It’s as simple as sitting back and waiting for your monthly delivery to arrive. Then, you get to enjoy incredible, high-quality and in-season fruits. Another great thing about using a fruit of the month club is that you’re getting these delicious fruits straight from the farm. When you buy from the grocery store, there are usually middlemen in between the time the fruit was picked at the farm and when it lands in the produce section at the store. Even the grocery store itself could be considered a “middleman”. Because of this time delay, fruit is often picked prematurely so that it doesn’t get ripe and spoil before making it to your home. Here is a great article that examines how long “fresh” fruit is picked before it makes it into a grocery store and eventually eaten by the customer. With monthly fruit clubs like the ones we examined above, you’re getting the fruit delivered straight from the source (from most of them). You’ll be able to enjoy fresher, juicier fruit, with higher amounts of vitamins. While there’s nothing wrong with getting your fruit at the grocery store or the farmer’s market, you don’t always know what you’ll find. Think about it… How many times have you gone to the store to pick up bananas and the entire selection just looked rather rough or completely green? And then, you wind up leaving with no bananas in your shopping bag. Unfortunately, there’s just no telling what the stock at your local grocery store is going to be like. One week, the fruit could look incredible. And the next, you might discover brown bananas and bruised apples. Although fruit doesn’t need to be perfect in order for you to enjoy it safely, a fruit of the month club is going to help ensure the quality of what you receive. They’ll send you a selection of fresh fruit that’s ripe and unbruised, so you never have to question what’s inside your box. Nor do you need to worry about picking just the right fruit every single time. That’s sure to shave some time off your grocery store trips! However, if you’re a fan of imperfect produce, there are services out there that deliver wonky, but totally good to eat, fruits that the grocery stores wouldn’t carry. If you know someone who loves to get in their daily dose of fruit, signing them up for a fruit of the month club can actually be a great gift. It ensures they get regular deliveries of fresh, delicious fruit that they can enjoy in smoothies, baked goods, or just on their own. But there’s nothing that says you can’t get it as a gift for yourself! If you’re the biggest fruit lover in your life, find a fruit of the month club you love and gift yourself monthly deliveries of high-quality, juicy fruits. It’s sure to put a smile on your face with every delivery you receive. Choosing the fruit of the month clubs on this list was no walk in the park! We abided by a strict list of qualifiers to help us make the final decision. What’s the point of subscribing to a fruit club if they aren’t going to send the highest quality fruit. And the highest quality fruit comes from ones picked at the peak of their season. Trusted fruit of the month businesses have been around for years. Some, like Harry & David, have been around for decades. Choosing a fruit club that has the experience behind them is an important qualifier we considered when putting together this list. People try fruit boxes because they want to eat fresh, healthy, and delicious fruit but also because they want to try new fruits. When choosing, we also considered reviews from other long-term fruit of the month club members. This meant souring social media, blogs, and traditional review websites to find testimonials from real customers. Fruit is perishable. Therefore, it’s important to have some type of guarantee to ensure freshness and packaging is 100%.